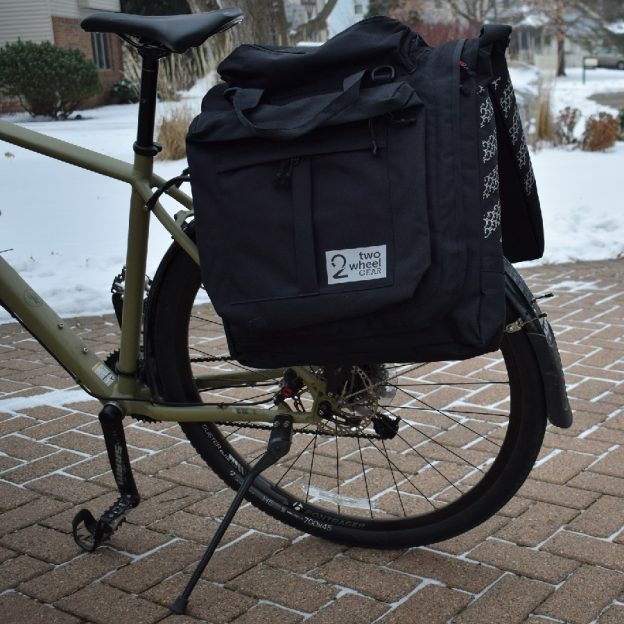 The Classic 2.0 Garment Pannier may be the perfect travel bag for a bicyclists. Especially when packing dressier clothes for the commute to work or touring. If your next trip requires posher duds for that special event or evening attire, Two Wheel Gear has you covered. This pannier is roomy, with a universal attachment system that fits any standard bike rack. When space is needed for a suit this pannier works perfect for both the touring cyclist and the business professional. If dress attire is not a prerequisite the space is flexible enough to keep all your gear neat and organized. Here the content in this carry-on luggage all fits into the Classic 2.0 Garment Pannier below. 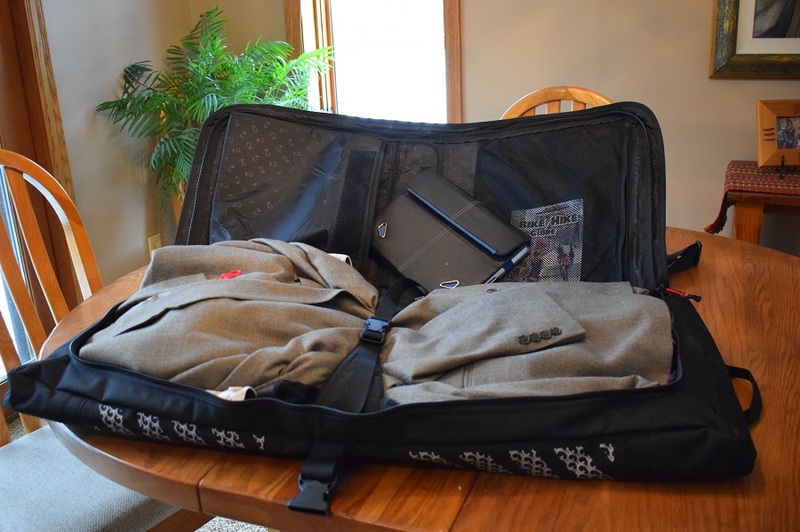 Items transferred from the carry-on luggage and comfortably lay in the Classic pannier with a sports jacket and laptop included. For me the pannier works well when exploring a new destination to write about or biking to a power meeting. See the video on this multi-functional pannier. With this bag there are less chances of the clothes wrinkling when secure in the pannier. 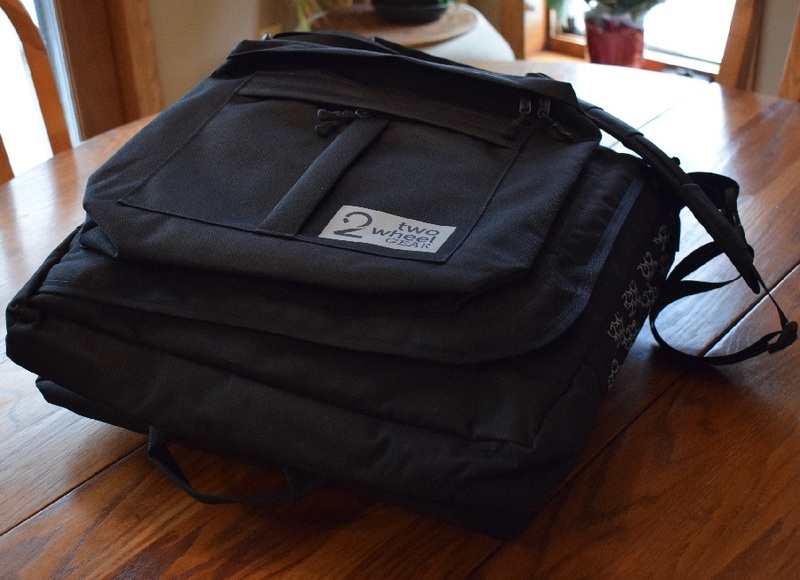 For meetings, with the Two Wheel Gear’s Classic I can safely pack my laptop, presentation boards and promotional material. As the perfect all-in-one luggage bag this pannier also meets airline carry-on requirements. Plus, in the satchel position with the shoulder strap, it’s easy to carry. The Two Wheel Gear’s Classic 2.0 Garment Pannier, in its satchel position, meets airline requirements for carry-on. 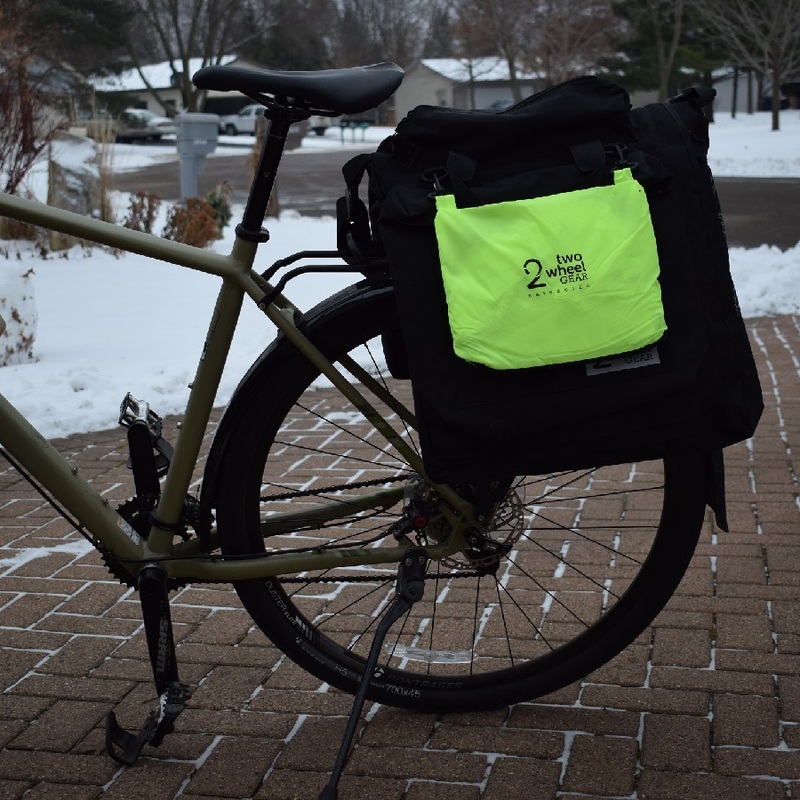 For the daily commute or a multi-day bike trip the Classic 2.0 Garment Pannier is a great addition to any cyclist’s inventory of gear. With several compartments in the bag, organizing everything you need to shower and change for a productive day at the office or on a trip is a breeze. This Classic Garment Pannier comes with a clip on bag to store the highly visible waterproof cover. 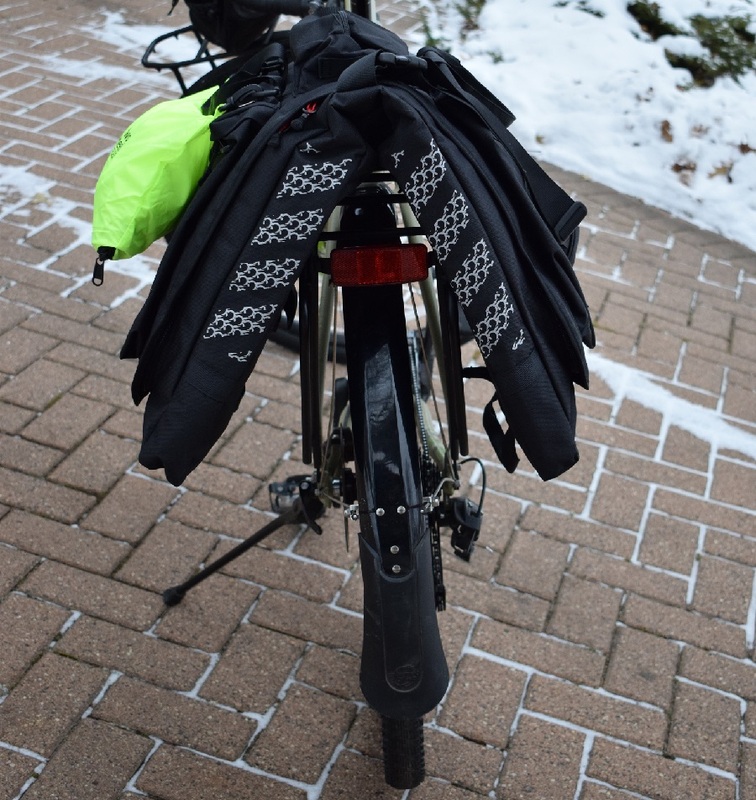 With the universal mounting clips on the bottom side of the panniers makes it a snap to clip the bag onto the rear rack. That is all that is required to easily mount the Classic Garment Pannier (see video). 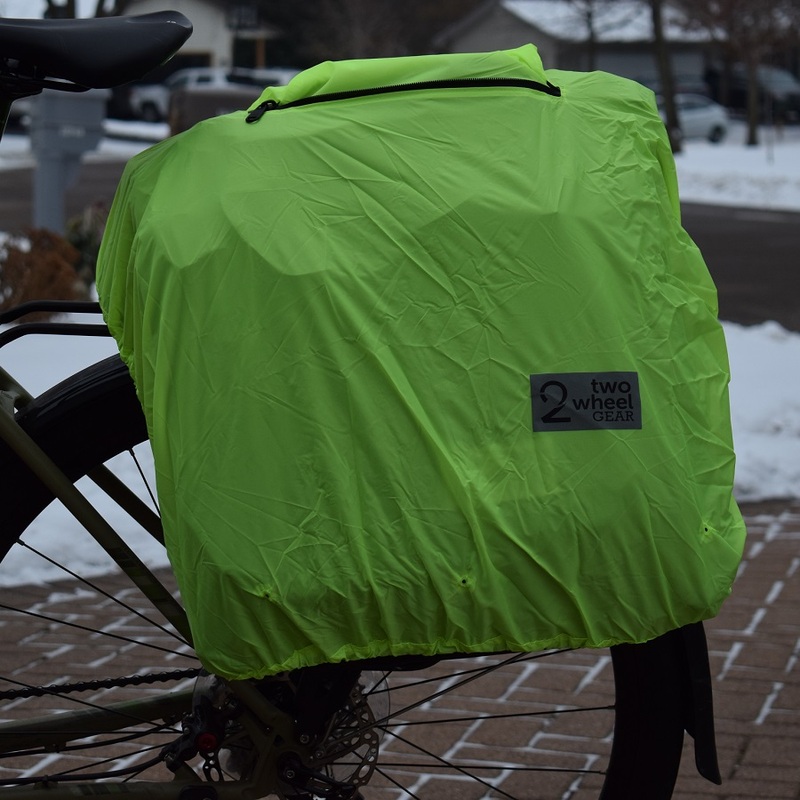 Here the Classic’s highly visible and waterproof cover protects the pannier from wet weather and road residue. In a clip-on pouch, the Classic’s cover will keep your gear dry in wet weather conditions. Using the neon green cover with reflective silver accents over the panniers also adds additional visibility to the bike. A helpful tip: If the pavement is wet and the bike lacks wheel fenders consider using a sheet of plastic material over the bike rack before securing the bag. This will act like as a guard helping to repel moisture away from the underside of the pannier. The Two Wheel Gear panniers exterior offer reflective material and straps to attach a blinking light for more visibility. Everything about this Two Wheel Gear bag is durable and high quality. Even the zippers to several compartments will help keep things organized. The bag also has a 15″ padded sleeve compartment designed for a laptop. 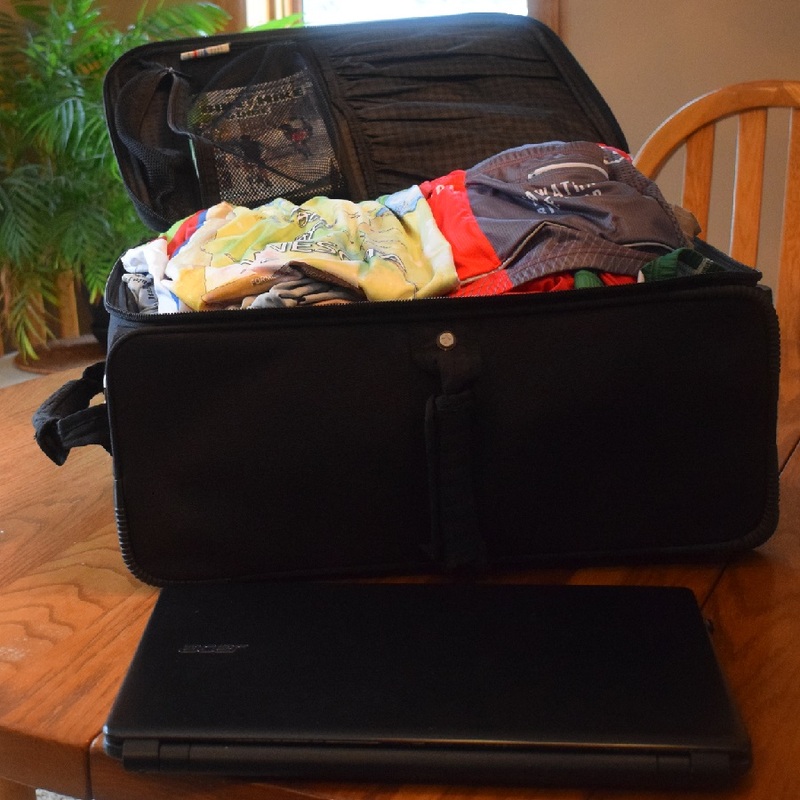 This allows me the opportunity to leave my computer bag at home and use more of the Classic’s all-in-one features. This entry was posted in News, Products and tagged 2 two wheel gear, bike bag, Bike commuting, bike commuting gear, bike rack accessories, bike touring, bike touring gear, Classic 2.0 Garment Pannier, garment panniers, multi modal commuting, Multi-day bike tips, Two Wheel Gear, universal pannier mounting system on May 5, 2018 by Russ Lowthian.